A pre-incubator programme for future changemakers! Do you have an idea or project looking to advance the UN Sustainable Development Goals (SDGs)? Join our 8 week tailored Global Goals Labs program and become an integral part of the conversation and action towards achieving the Global Goals by 2030.? The Global Goals Labs for Youth is a pre-incubator programme for students and future young social innovators to actively participate in the global development agenda through designing and implementing local impact projects/initiatives. The top 5 teams from the call for applications will be selected to participate in the The GGL4Youth cohort 1, which will kickstart end of February. The final deadline to submit your applications is February 17th 2019. What is the Global Goals Labs for Youth? 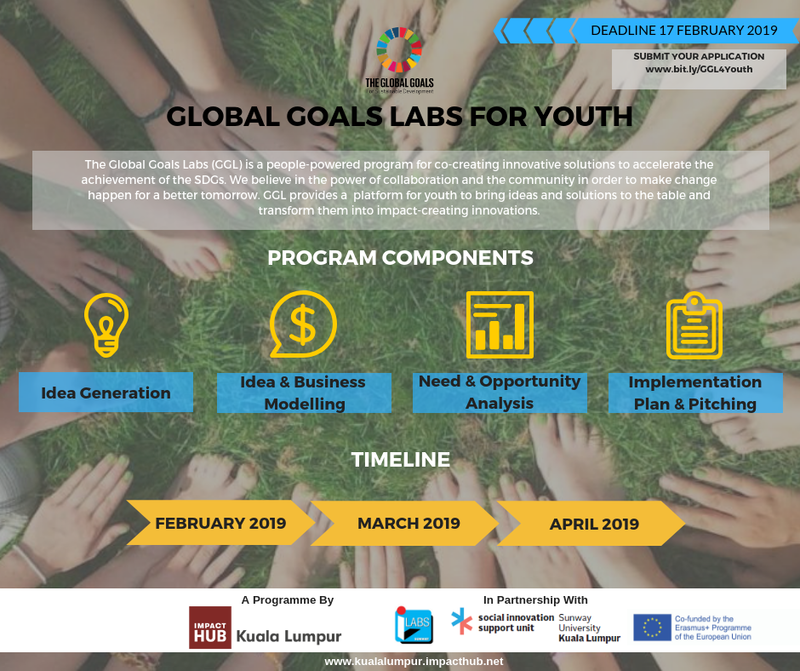 The Global Goals Labs for Youth (GGL4Youth) is modelled around Scope Group’s highly successful impact accelerator that has been run in Malaysia since 2013, and built in partnership with Social Good Brasil, Social Good US and Impaqto. Selected participating teams will go through an intensive 2-month pre-incuabtion programme where they are matched with multi-sector partners (Government/Corporates/Ecosystem Players & Academia) to provide guidance and collaborate for the purpose of driving action and delivery of the SDGs through their joint innovations. How do I know if my idea/project fits the topic of the programme? Is your idea original and innovative? Does it seek to address any of the the UN Sustainable Development Goals (SDGs)?. Does it solve an existing social or environmental challenge? Does it impact the local communities in Malaysia ? Does it fill an existing gap in the Malaysia? Can my team submit more than 1 idea/project? Yes, your team can submit several ideas at the application process. However in interest of fairness to all other participating teams only 1 of your ideas may be selected to qualify for the Global Goals Labs for Youth. Yes, you can register yourself as an individual at the point of application. However this is a team challenge. We will give you time to get your team together. Kindly notify us by 17th February 2019 on information of new members in your team. Notification can be made to Ralph at ralph.mpofu@impacthub.net. How will i know if my team has been selected as one of the Finalist teams? Finalist teams will be notified by email by 19th February 2019. Announcements will also be made here on our website and on our social media pages. Are there any application/program fees? Contact our Catalyst, Partnerships & Community Manager, Ralph at ralph.mpofu@impacthub.net if you have any questions or doubts?